DJ Kool Flash has had a busy year for herself. The now 9-year-old DJ has stayed on her grind and garnered props from hip-hop legends and luminaries from all across the board. From the DJ circuit with the likes of Statik Selektah and DJ Tony Touch to emcees such as Rakim, EPMD, Sadat X, and the Duck Down collective, the youthful phenomenon shines brighter with the more work she puts in. With the connections she’s made in the hip-hop world, she’s recently released her second full-length mixtape. Hosted by M1 of dead prez, “Underground Playground, Vol. 1” is a blend of 20 tracks over the last five years from a collection of who’s-who in subterranean hip-hop. While anyone with a vast collection of music can take some of their favorite tracks, throw them on a playlist, and then call it a day, there has to be some care and art, to an extent, in doing so. Carefully-picked choices and their proper placement order matter in the creation process, especially when you want it to sound good and suspend the feeling of randomness. Her debut, “Ladies First, Vol. 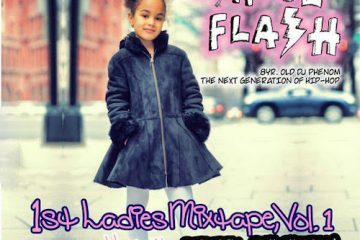 1”, was conceived as a mix of tracks from mostly-all female emcees with the common theme of empowerment. Her sophomore mixtape, though pre-dominated by male emcees, is her own aural play area for underground rap’s big kids where she makes all the rules. The first rule on the mixtape was obvious from the jump: You’ve got to be dope. As a testament to that dopeness, some emcees have been included for more than just one appearance here. Queens legend Pharoahe Monch appears as a star assist on two tracks: Torae’s “What’s Love” and “Swarm” by A-F-R-O and Marco Polo. The second to make two appearances are dead prez, capping off the mixtape with their two tracks “I’m an African” and “Hip Hop”. Most of the mixtape songs were hand-picked from the New York/tri-state underground region given the prominence of their presence. The production of each track has East Coast values with either jazzy or dark aggressive beats coupled with a devotion to sample usage. Boston-based Mr. Lif is included with his track “Pounds of Pressure” on the first half of the mixtape, as is Washington, D.C. native SA Roc with a remix of her track “Evil Knievel”. The Rhymesayers-signee’s inclusion is significant as she’s the mixtape’s first female emcee to grab the listeners’ attention. Kool Flash making her a part of her project is also demonstrative of a mixtape’s capabilities for showcasing talent to those who’ve been unaware. Even recent tracks such as De La Soul’s “Nosed Up” made the cut. The second half of “Underground Playground, Vol. 1” has a firmer sound than the first half. The urban jazz tinge of Lewis Parker’s “Release the Stress” is given a smooth transition by Flash into the harder “Flexxin” by Mayhem Lauren. Immediately afterwards, lyrical hitters Rah Digga and Lyric Jones team-up for a ‘Walter Cronkite flow’ on the ominous “Ski Mask Way”. Chris Rivers’ appearance with “Black Hearts” is a treat because his lyrical style keeps making me wish he’d drop an album. Kool Flash’s inclusion J. Dilla’s remix to Jay-Z’s “Allure” is fitting as she is a member of the former’s posthumous foundation. The tri-state sounds of Connecticut and New Jersey come together on the track “Power” by emcee Blacastan and producer Mr. Green, respectively. Before dead prez closes things out, Bahamadia spits nostalgic bars on the minimalistic “Culture Cut”. After that, “That’s Hard” from Pete Rock & Smif-N-Wessun drops, with assists from the late Sean Price and Styles P, the third artist to have two appearances here. As one with a predilection for talent from the underground hip-hop, this mixtape was more than satisfying. In fact, it was a well-conceived effort by an artist with an almost intuitive understanding of turntables. DJ Kool Flash’s youth and gender are largely what make her a novelty, not just her loyalty to hip-hop and its true essence. As she grows older, her gender and her evolving skills will take center stage, giving her the potential to carve out a niche for female artists in hip-hop areas where they are scarce and unheralded. Given her literal track record now with this mixtape, I say she’s well on her way.